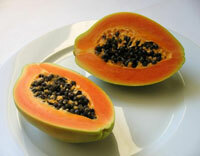 Researchers found in a study that the leaf extract and tea of papaya greatly slowed the growth of cancerous tumors. Nam Dang of the University of Florida said the anticancer capability of papaya was strongest when large doses of papaya leaf tea were administered into cells. The study shows that papaya is effective against cancer of the cervix, breast, lung, liver, and pancreas. The papaya’s effectiveness lies in its ability to increase the body’s production of immune-system regulating molecules called Th1-type cytokines, Daily Contributor reported. Papaya has been used as a folk remedy for a variety of ailments in many parts of the world, especially Asia. Deng said the results are consistent with reports from indigenous populations in Australia and his native Vietnam. Dang and a colleague have applied to patent the process to distill the papaya extract through the University of Tokyo, AFP informs. "We have always known that papaya has a lot of interesting things in there," said Aggarwal, a professor in the center’s department of experimental therapeutics who was not involved in the UF research. Foremost among papaya’s health-promoting agents is papain, papaya’s signature enzyme, which is found in both the fruit and the leaves. Aggarwal also noted that papaya extract’s success in reducing cancer in laboratory cell cultures must next be replicated in animal and human studies. "I hope Dr. Dang takes it further, because I think we need enthusiastic people like him to move it forward," Aggarwal said, Insciences Organisation informs.